I've been quite upset with the newsletter archive provided by Mailchimp (here's mine). It only displays the 20 last emails and doesn't look very great. Also, the call-to-action to sign up isn't perfect. For comparison, just have a look at how Revue does it (example: Johannes Klingebiel's great newsletter), it's so much better! Also, my personal website is quite rusty. 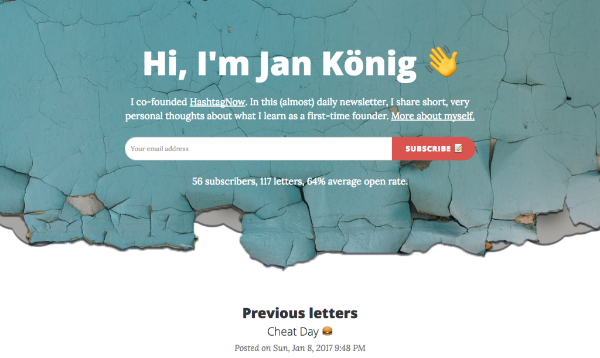 Since I moved my writing to this newsletter (and Medium), there hasn't been a lot going on on my Wordpress installation. It's a great little project for coding beginners because it combines simple stuff (fetch data from the Mailchimp API, save it to a database, display it) with the possibility to do more (analytics, better design, more APIs, tagging...). Do you currently have a side projects to improve your development/design/writing/... skills? I'm interested!